It was this morning in 1858 that the gaily dressed Yakama Indian guerrilla Qualchan turned himself in to his Anglo hunter, and was promptly put to death. Wright was prosecuting the Yakima War in the Pacific Northwest — another characteristic Indian conflict featuring a formerly remote tribe suddenly cursed with valuable land by the discovery of gold. 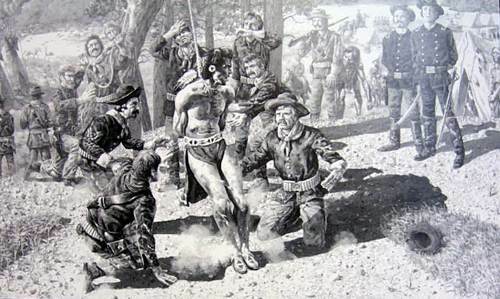 Qualchan (sometimes “Qualchen”, “Qual-Chen”, or “Qualchien”) was among the Yakima chieftains resisting “encouragement” to give up that part of their territory most desirable to white settlers, and eventually, Qualchan killed encroaching white miners and made himself an outlaw. Qual-Chen … has been actively engaged in all the murders, robberies, and attacks upon the white people since 1855, both east and west of the Cascade Mountains … committing assaults on our people whenever the opportunity offered. Kamiakin and Qualchan, cannot longer be permitted to remain at large or in the country, they must be surrendered or driven away, and no accommodation should be made with any who will harbor them; let all know that asylum given to either of these troublesome Indians, will be considered in future as evidence of a hostile intention on the part of the tribe. 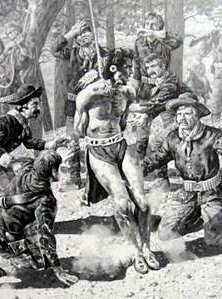 The expedient that induced this potent commando to throw his own life away was the capture of Qualchan’s father, Owhi, rather dishonorably effected on an invitation to parley, then parlayed into a threat to execute the hostage lest the wanted Yakima produce himself. Wright’s rough peace caused the nearby creek in eastern Washington to be christened “Hangman’s Creek”, though there’s been a tendency to steer away from that frightful name in recent times. But what better way to honor an indigenous foe of colonial land conquest than by naming a golf course for him? The unfolding fate of the Yakimas is further explored in the public-domain book Ka-mi-akin, the last hero of the Yakimas, whose title character was Qualchan’s uncle.